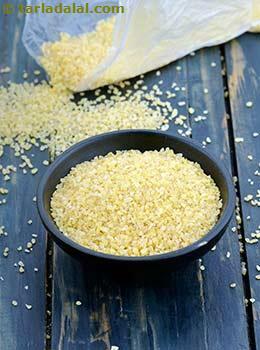 Broken wheat or cracked wheat or couscous is made by milling whole raw wheat grains coarsely. It is popularly known as Dalia. Dalia has glycemic index of 41 which falls under low GI range. This is best understood by glycemic load which is 9.4. It the healthier option to choose over any refined and processed food. it also helps in relieving constipation because of its high fiber content. Is Broken Wheat safe for Diabetics? The glycemic load of raw broken wheat of around 1/4th cup (approx. 30 grams) is 9.4 which is low. Dalia is recommended for diabetics because of its low glycemic load. Dalia is an excellent source of complex carbohydrates. This maintains the energy levels which slowly releases the glucose into the bloodstream and the blood sugar levels won't spike up instantly. Dalia is popularly consumed by diabetics as a morning breakfast either with milk as a porridge or with lots of vegetables. Moreover it is important to provide small and frequent meals at regular intervals to maintain the carbohydrate intake. Is Broken Wheat suitable for Weight Loss? The fiber content in broken wheat makes it an ideal meal for the weight watchers. This will keep you full for a longer period of time and eliminates unnecessary binge eating. Dalia is a super food one should try to include in their diet over something loaded with calories and fats. Dalia has negligible amount of fats. Combine your Dalia with any of your pulses so that you get a complete protein. Fada Ni Khichadi is a wholesome meal which combines Dalia with yellow moong dal. It is the powerhouse of nutrients especially for vegetarians who is looking for food which is healthy as well as tasty so that the weight loss journey is easier and guilt free.